Newly formed mega housing association Notting Hill Genesis (NHG) held its Corporate Strategy Event on 21st March. The purpose of the event was to inform staff of the new structure following the recent merger and it also gave staff the opportunity to direct questions to the Executive Board. There were hundreds of staff in attendance and they were not impressed. Staff asked some searching questions following a summary of how the merger was going to change the business. CEO Kate Davies highlighted NHG's core values especially its honesty and commitment to dealing with difficult questions. She was subsequently held to account by a member of staff who asked, "Given our values are centred around honesty, how can we trust her given that she hosted her private book launch on the anniversary of the Grenfell disaster on NHG premises?" He self promotion as a fashion guru at this time was met with widespread distaste. This met with spontaneous warm applause from the entire audience. 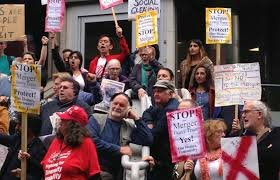 Residents protest against Notting Hill Housing - Genesis merger. Kate Davies defended her decision by claiming that she had the support of colleagues in the housing sector! This despite the fact that Notting Hill Housing had tenants in Grenfell. Her response was met with shock and disbelief by most attendees. This is further evidence of how far senior managers of in the housing sector have become part of a cooperate machine and are entirely removed from the interests of ordinary tenants and housing workers. She also upset staff with inadequate answers in relation to questions about diversity and governance. Kate Davies salary was £239,000 before the merger created a larger organisation. Staff feel she lives on a different planet to either them or to NHG residents. Staff raised other issues concerning diversity, assimilation, employment contracts and benchmarking. 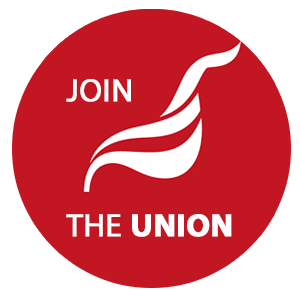 In the course of the coming weeks Unite will seek to hold management to account on these issues as well as opposing any compulsory redundancies; we are told changes are not about cutting staff so why not make the commitment?